Barnes & Noble, the Gap, RadioShack, and Sears: that may sound like the lineup at your local mall, but in fact they are just a few of the retailers scheduled to step into the earnings spotlight this week. Following last week's disappointing January retail sales numbers from the Commerce Department -- but strong fourth-quarter reports from Abercrombie & Fitch (ANF) and Nordstrom (JWN) -- the coming week will offer plenty more data on the sector for investors to mull over. Bentonville, Arkansas-based Walmart (WMT) offered free holiday shipping, closed its Moscow office and named a chief merchandising officer during its fourth quarter. Analysts surveyed by Thomson Reuters forecast earnings for that period to come to $1.31 per share, up from $1.17 in the same quarter of last year. The world's largest retailer also is expected to post revenues of $117.7 billion for the three months that ended in January. That's 3.5% more than a year earlier. For the full year, the consensus forecast is for earnings of $4.05 per share (+9.6%) on revenue of $423.3 billion (+3.7%). Walmart earnings have not fallen short of consensus expectations in the past five quarters. 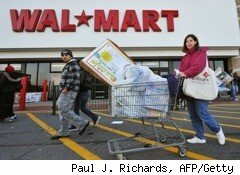 Walmart has a long-term EPS growth forecast of 10.4%, as well as a forward price-to-earnings ratio (P/E) of 12.8. Its PEG ratio is 1.2, the dividend yield is 2.2% and its return on equity (ROE) is 20.9%. The First Call consensus recommendation has been to buy WMT for more than 90 days. Zacks remains cautious, though. The mean price target is currently $60.27. The share price hit a 52-week high of $57.89 in late January but has pulled back recently to fall below $55, as well as the 100-day moving average. During the three months that ended in January, Home Depot (HD), the second-largest retailer in the U.S., also offered free shipping for the holidays. It also launched an online site for do-it-yourselfers and saw changes to its Canadian leadership. The Atlanta-based home improvement chain is expected to post fourth-quarter earnings of 31 cents per share, a 22.6% rise from a year ago. And analysts are looking for a marginal increase in revenue to $14.8 billion. The consensus full-year forecast calls for earnings of $1.98 per share (+16.2%) and $67.7 billion (+2.6%) in revenue. Home Depot has topped earnings estimates in the past five quarters, by as much as 7 cents per share. Its long-term EPS growth forecast is 13.9%. The forward P/E is 17.6, but that's less than the industry average. Home Depot has a PEG ratio of 1.3 and a dividend yield of 2.5%. Analysts on average recommend buying HD; Oppenheimer recently raised its price target to $45. Last week, shares closed above $38 for the first time since 2007. Analysts anticipate that on Friday JCPenney (JCP), the venerable catalog and department store operator, will report its fourth-quarter earnings came in at $1.08 per share, up 22.2% year over year. Texas-based JCPenney launched a Global Brands Division, announced management promotions and launched mobile initiatives during the three-month period that ended in January, and revenue for the quarter is predicted to total $5.7 billion, an increase of 2.7%. And analysts anticipate full-year per-share earnings of $1.56 (+31.5%) and $17.8 billion in revenue (+1.2%). JCPenney has met or beat EPS estimates by a penny or two in recent quarters. The 14.7% long-term EPS growth forecast tops those of competitors Kohl's and Macy's. Its forward P/E of 21.6 is less than its trailing P/E and the industry average. The PEG ratio is 1.5 and the dividend yield is 2.2%. While JCP doesn't have a consensus buy recommendation, an upgrade or two following the quarterly report would shift it into the buy column. DailyFinance contributor Joseph Lazzaro is bullish on JCP. Shares are up about 14% year to date, venturing north of $37 last week for the first time since 2008. Other retailers expected post fourth-quarter strong earnings growth this week include the Cracker Barrel (CBRL), Dollar Tree (DLTR), Gap (GPS), Kohl's (KSS), Limited Brands (LTD), Lowe's (LOW), Saks (SKS), Target (TGT) and Zale (ZLC). Those predicted to report more modest earnings growth include Macy's (M), Safeway (SWY), Sears (SHLD) and TJX Cos. (TJX). Per-share earnings from Barnes & Noble (BKS), HSN (HSNI) and RadioShack (RSH) are expected to have slipped from a year ago, while a loss is anticipated from Office Depot (ODP).